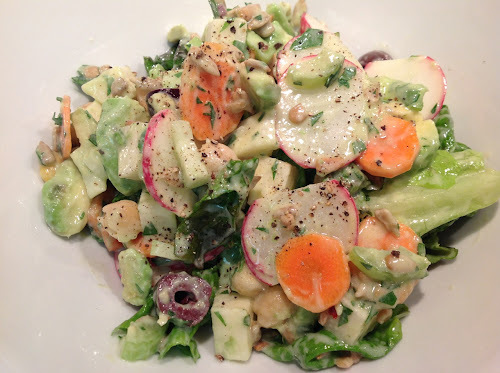 This winter chop salad appeared in the February 2011 issue of Bon Appétit. It has a lot of ingredients, so get your chopping arm ready. The recipe writers declared it was designed around a love of the vegetable kohlrabi. Well, guess what…Whole Foods didn’t have any kohlrabi, so my version is kohlrabi-less. There are so many other tasty vegetables here though; I don’t think you’ll miss it much. But if you can find it, by all means toss some in. I made a few other modifications to the recipe: I added agave nectar to the dressing so that it would have a little sweetness and substituted olive oil for the canola. Another ingredient I couldn’t find was whole-milk yogurt, so I substituted lowfat, which worked fine. If you want to add some meat, this salad would also be great topped with some sautéed or grilled chicken. Bacon crumbles would be good too. 1. Add garlic to a small bowl, sprinkle with salt and use a blunt instrument (spoon or muddling tool) to mash into paste. Add other dressing ingredients and whisk to combine. 2. In a large bowl, combine salad ingredients. Toss with dressing and serve on plates or large bowls. OK, now I really want to try kohlrabi. Where do we find it? Perhaps it ran off with the thyme that is missing from every grocery stores in our neighborhood.